Three foreign powers who have shaped Syria's civil war - Iran, Russia and Turkey - will discuss ways to wind down the fighting on Wednesday despite their involvement in rival military campaigns on the ground. The leaders of the three countries will meet in Ankara for talks on a new constitution for Syria and increasing security in "de-escalation" zones across the country, Turkish officials say. The Syria summit brings together two powers which have been President Bashar al-Assad's most forceful supporters, Iran and Russia, with one of his strongest opponents, Turkey. Cooperation between the rival camps raised hopes of stabilizing Syria after seven years of conflict in which 500,000 people have been killed and half the population displaced. But the violence has raged on, highlighting strategic rifts between the three countries who, in the absence of decisive Western intervention, hold Syria's fate largely in their hands. Syria's army and Iran-backed militias, with Russian air power, have crushed insurgents near Damascus in eastern Ghouta - one of the four mooted "de-escalation zones". Turkey, which sharply criticized the Ghouta offensive, waged its own military operation to drive Kurdish YPG fighters from the northwestern Syrian region of Afrin. It has pledged to take the town of Tel Rifaat and push further east, angering Iran. 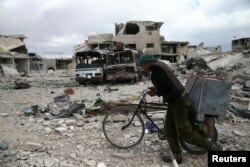 A man walks with his bicycle at a damaged site in the besieged town of Douma, Eastern Ghouta, in Damascus, Syria, March 30, 2018. "Whatever the intentions are, Turkey's moves in Syria, whether in Afrin, Tel Rifaat or any other part of Syria, should be halted as soon as possible," a senior Iranian official said. Iran has been Assad's most supportive ally throughout the conflict. Iran-backed militias first helped his army stem rebel advances and, following Russia's entry into the war in 2015, turn the tide decisively in Assad's favor. A Turkish official said Ankara will ask Moscow to press Assad to grant more humanitarian access in Ghouta, and to rein in airstrikes on rebel-held areas. "We expect ... Russia to control the regime more," the official told reporters this week. Ankara's relations with Moscow collapsed in 2015 when Turkey shot down a Russian warplane but have recovered since then - to the concern of Turkey's Western allies. Turkey was one of the few NATO partners not to expel Russian diplomats in response to a nerve agent attack on a former Russian agent which Britain blamed on Moscow - an allegation which Turkey said was not proven. Improved political ties have been reflected in Turkey's agreement to buy a Russian missile defense system and plans for Russia's ROSATOM to build Turkey's first nuclear power plant. Turkey has also expanded relations with Iran, exchanging visits by military chiefs of staff, although its deepening ties with Tehran and Moscow have not translated into broader agreement on Syria's future. FILE - In a photo released by the official Facebook page of the Syrian Presidency, Syrian President Bashar al-Assad speaks to Syrian diplomats, in Damascus, Syria, Aug. 20, 2017. 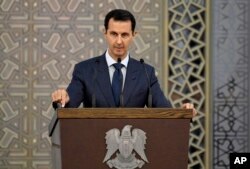 Iran remains determined that Assad stay in power, while Russia is less committed to keeping him in office, a regional diplomat said. Turkey says Assad has lost legitimacy, although it no longer demands his immediate departure. At a meeting in Russia two months ago, boycotted by the leadership of Syria's opposition, delegates agreed to set up a committee to rewrite Syria's constitution and called for democratic elections. Turkey says Wednesday's meeting will discuss setting up the constitutional committee, humanitarian issues and developments in Syria's northern Idlib region, which is under the control of rival rebel factions and jihadi groups, and where Turkey has set up seven military observation posts.